Millions of children play organized sports. As competition increases, the pressure on young athletes intensifies, often leading to sports injuries. The good news is that more than half of sports injuries can be prevented. Dr. Carol Frey, orthopedic surgeon and former college athlete, offers this definitive guide filled with practical information about the most common sports injuries in kids from head to toe. While explaining complex medical issues in clear terms and providing facts and case studies for readers who find themselves in the emergency room, Dr. Frey covers these specific topics and more: -Doctor-recommended methods to treat and prevent specific injuries (on the sidelines and at home) -Best ways to come back both physically and psychologically from a sports injury -Risks and benefits of playing certain sports -Why kids' injuries are different -What parents absolutely must know about concussion -The perilous problem when parents go wild -Vital differences between male and female athletes Don't Worry My Mom is the Team Doctor is a comprehensive, easy-to-understand guide that will help young athletes stay competitive, be healthy, and avoid injury. Dr. Carol Frey, an orthopedic surgeon who has cared for Olympians and professional and high school athletes, is former Chief of Foot &amp; Ankle Surgery at USC and now teaches at UCLA. She has appeared as an expert on youth sports injuries for national media. 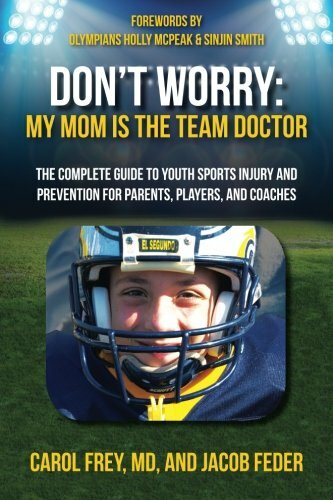 Dr. Frey&#x2014;the &#x201c;team doctor&#x201d; and mom to sons who play sports&#x2014;is partner in the West Coast Sports Medicine Foundation in Manhattan Beach, California. Coauthor son Jake, an undergraduate student athlete, wants to pursue a writing career.